As summer draws to a close many are thinking of how to squeeze the last bits of fun out of this season. One great way to enjoy late summer and early fall is camping. You don’t have to go far to sleep under the stars with excellent locations for both tent and trailer camping across Ontario. 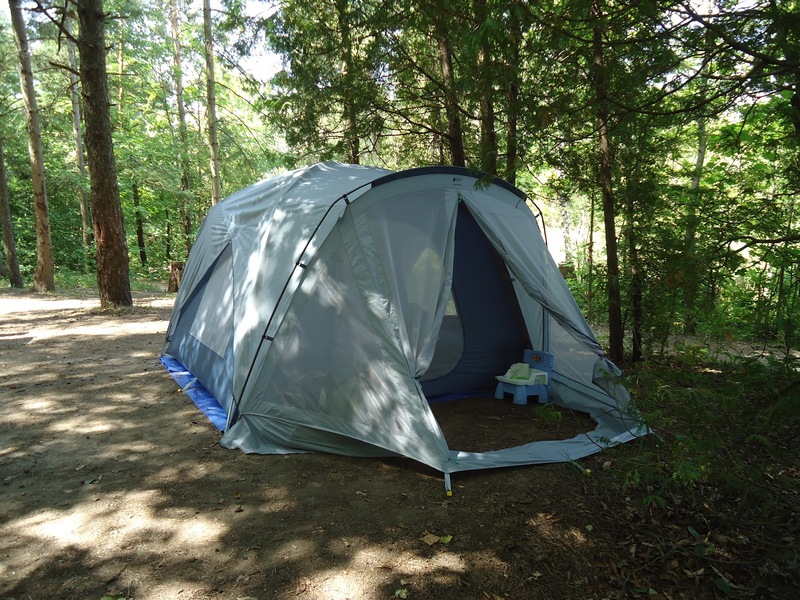 If you are tent camping you will probably not need water and hydro hook-ups and depending on if you go to a conservation area, provincial park or private campground, you can expect to pay from approximately $35 and up per night for your lot. 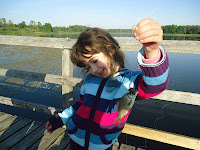 Provincial Parks across Ontario. As a young adult, my friends and I would camp in bigger groups and tended to more commercial parks that offered amenities like a snack shop as we were more often than not inadequately prepared. My husband started later but was more adventerous doing some outback camping in addition to the standard campground type. Now with a family of my own I looked forward to bringing my girls camping so they could have the same great memories as I have of campfires, the smell of the morning air and running around meeting new “campground friends”. At two and five years this may not all be possible the first time out, but no time like the present to start. 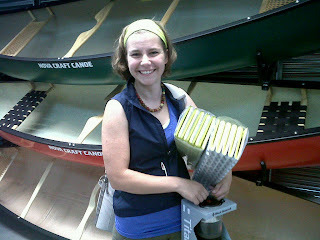 After much searching, I found the camping gear that we had accumulated over the years and wondered how much was salvageable for a family trip, luckily Burlington is home to Mountain Equipment Co-op and I headed there to meet up with Camping Product Specialist – Annika or the Camping Goddess as I like to call her who set me up with some camping gear for our first family trip. Whether you are a first time camper or a seasoned pro, you will be able to find most items that you need to make your experience great. I think what I like best about the approach at MEC is that Annika truly was interested in helping me and my family have a great experience, she took the time to ask questions about our previous experience, where we were going, the kids and what they would be doing, etc. and then she made recommendations on what we needed, what is good to have and what is a “luxury” item. She also made suggestions about others items we might need, even if they were not sold at her store. First and foremost on the list was a tent and in the end we went with a Funhouse 4, because it offered enough room to stand up and as anyone will attest to that has hunched over in a tent trying to change, that is a big plus. This tent is so quick and easy to set up, I was amazed, so much better than the tents of old. I have to add that one of the best things about this tent was that they include a tent peg mallet – it’s the little things for me. The take-down only took about 10 minutes and I was able to do it myself while I send my husband off with the girls. It also has a ‘vestibule’ that gives some extra rooms for bags, removing your shoes and for us, a potty as I had no intention of trekking to the washrooms repeatedly with my toilet training two year old. If you have a family of four or more, I would suggest moving up to the Funhouse 6 as it gives the adults more space especially if you are using air mattresses under your sleeping bags. We initially planned to give the girls the underpads and use the air mattress for the adults but after several sleeping arrangement re-designs to best use our space we ended up using the Therm-a-rest sleeping pads under our bags and gave the girls the mattress. I think once you are past your twenties, an air mattress is a must unless you are outback camping where space and weight needs to be optimized. We opted to use our old sleeping bags for us and I wasn’t quite sure what to do with the kids – who knew they made child sized sleeping bags. Back in the day, my parents just put me in an adult one and hoped for the best. Mind you in those days we didn’t have car seats and I am pretty sure seat beats were optional. 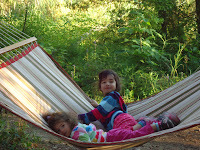 Annika suggested the Lil’ dipper sleeping bag, it comes in two sizes which was perfect for both girls and as an added bonus they have them in purple which ensured they were a hit. 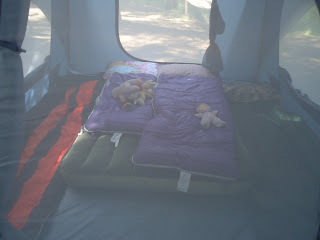 As it is getting later in the camping season, the nights are cooler and while I woke up shivering and searching for my fleece in the middle of the night, the girls were warm and cozy in their bags – I think I will be investing in a new sleeping bag for our next trip. If you are camping with kids or are looking to make meals quick and easy then you will want to bring a cook stove. 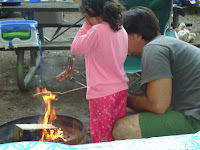 While cooking over a campfire is fun it’s not always quick and practical. We chose the Primus FireHole 200 Stove with a double burner (perfect for those that need coffee and food at the same time) and at $145 is a really worthwhile investment. In the words of my husband “this stove is awesome!” when coupled with a Glacier stainless steel percolator ($29) that brews six cups of really good coffee, waking up at 6:30am with the kids wasn’t so bad. Annika helped me choose a cookware set ($28) and plastic mugs (in fun colours) as our old stuff was probably not fit to cook with but she recommends if you are just starting out to bring stuff from your kitchen, you don’t need special gear for cooking but keep in mind if you are cooking over an open fire that it might not look as good when it returns. The downside of cooking is cleaning but we brought a collapsible wash basin and the pocket bucket ($15) which folds up and was great for hauling water and serving as a rinse basin. We brought along two coolers one vintage and a new and much improved MEC Chilli Cooler ($49). One cooler held the frequently and quickly used items like milk, juice boxes and produce and the other was for longer term storage and kept our items cold and food-safe as it was opened as frequently. 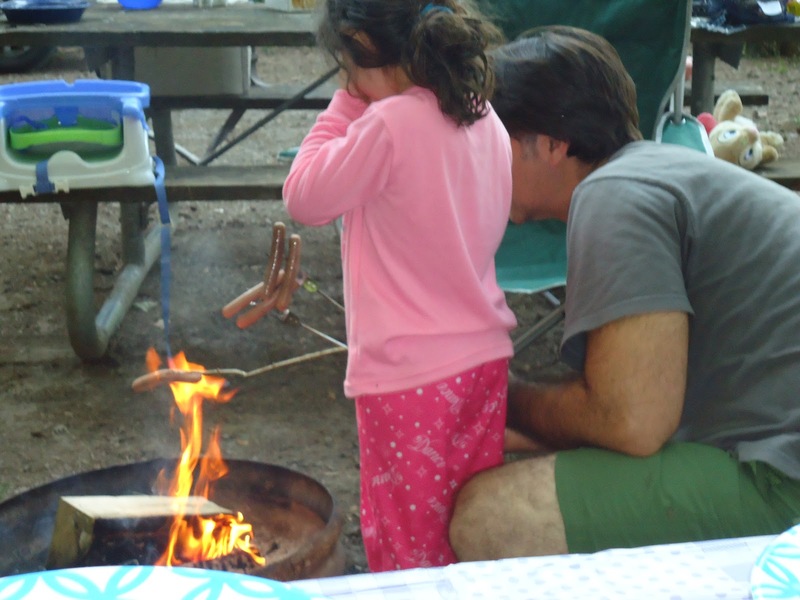 The highlight of the trip of course was the campfire; we had hotdogs and all the supplies for s ‘mores at the request of Lil' L and from the time we arrived she was anxious to start the fun. 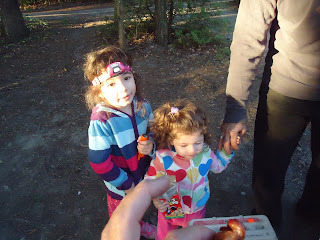 We roasted hotdogs over the fire, and the majority of the marshmallows were consumed “raw”, we did cook them over the fire for mom and dad. 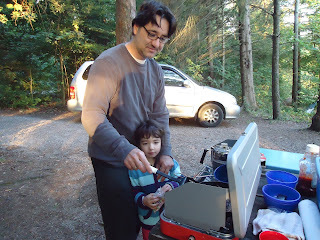 We had a great time camping and hope to go again this year if time permits. If not, next year we will venture out again and add to what we hope will be a lifetime of memories for our family.